Judging by Tanner's remarks in his "Introduction", he thinks the current Irish problem in Northern Ireland is precisely that ... an IRISH Problem. The IRA and the Catholic Church may want to claim it's about Britain (p 14), he says, because that provides a "secular" not a "sectarian" view of the issues. Northern Protestants have also "connived" in bolstering this view, he claims, because they cannot any longer use religion as the basis for their failed (Protestant) State in the northeast of the island.But, in truth, Tanner can only maintain this fiction -- that it's NOT about Britain or British imperial projects, and that it IS a dispute among various Irish sects "for the Soul of a Nation"-- by ignoring the evidence he himself presents in this unusual and engaging study of the troublesome issue of Religion in Ireland's history. If we assume (as seems reasonable) that the subtitle reflects the book's thesis, then the intelligent reader can only conclude that the facts paraded in this 431-page narrative undermine the notion that it's simply a struggle for "the Nation's" soul. [But ... which Nation? The English nation in Ireland? The Scots who settled the northeast? The "mere" Irish? :] The first Chapter makes clear that the roots of the problem were imperial (p. 29) and "racial" (pp. 26, 27, 32, 34 and passim) LONG before the canker of religion was injected into the equation. Despite these reservations, it was enlightening and thought-provoking to read this work. I haven't read any Irish history in over a decade, and while this volume doesn't follow the usual or traditional historians' framework, it does add considerable detail to the "traditional" story. I found the early chapters (1 through 9) somewhat disorganized ... it doesn't help the reader to be led around from post to pillar without any clear sense of what the point or destination might be. But I found Chapters 10 through 18 to be thoroughly engaging and informative. It was eye-opening to read about the narrow-minded and bigoted anti-Semitism of the Irish Catholic clergy in the 1930s (and earlier). Never, in all my years of reading Irish history, have I read of the Catholic priest in Kildare who described dance halls as "synagogues of Satan" (303); or of the claim that the cinema injected "Anglo-Jewish values" into the pure, Celtic culture of the unsuspecting Irish peasantry (304); or that the Irish towns were falling prey to "the flashy glitter of American-yiddish progress" (305). I had thought, growing up in Ireland, that this kind of cant was the stock-in-trade of 'Irish'-American Catholics, but that we in Ireland were somehow immune to that diseased mentality. Far from it, unfortunately.That Ireland is or was anti-Jewish in its core institutions is not a topic normally discussed in Irish history texts. Or at least, it wasn't when I was growing up there in the '50s and 60s. Similarly, the Fethard-on-Sea controversy in 1957, and Noel Brown's "Mother And Child Scheme" in the same decade -- a public health policy that would've reduced the Church's role in the delicate area of women's health "issues" (contraception, sexual health, etc) -- are treated here with the depth and seriousness which they has always deserved but seldom received. On reading this book, I could only marvel at my ignorance of the true face of my own country. Even as I was growing up in it, it never presented this bigoted aspect to me! It's almost like reading about a foreign country! !Tanner's work is not a book for the complete tyro; but it is a very rewarding and enlightening read for anyone with a strong grounding in the basic facts of Irish history since 1500. This is an okay book, and good from a historical standpoint, but I'm not a historian; I'm an anthropologist (and an editor, but that doesn't matter). I didn't like that most of this book was recitation of facts and very little interpretation of said facts. There was a lot of information I didn't have, and while no one needs the umpty-umpth recitation of the events surrounding the 1916 Easter Rising, it would have been really, really nice to have interpretation of lesser-known events. 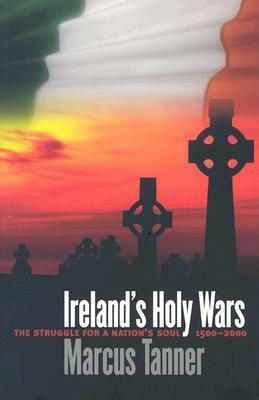 In the cases when that interpretation was supplied, I found it fascinating, particularly as the author got closer to modern times (I had the sense that this book was not written strictly as a whole) and was forced to interpret, at least some, the effects of the Church's abuse scandals and other troubles of the 60s and onward on Ireland and vice versa. But overall, I felt that this book was written by a historian who regarded interpretation as out of his remit; I also felt that the scope of the book (five hundred years of religious strife in one of the world's hot spots) precluded interpretation, but it did mean that lines became throwaways when they shouldn't have done. If there was no space to explain WHY it was important that such and such happened in Middleoftheroadingham in the year dot, why was it mentioned?I feel that, having read it, I have some greater sense of the history - and an understanding, in contrast to my understanding of the Palestinian conflict, that religion is an integral, essential part of the conflict between North and South when religion has little to no role in the Palestinian conflict - of the Irish conflict, but it's only one step up from what an encyclopedia could give me. I'd call this a good introductory book for people looking for a very general overview, but the proliferation of names makes it hard to follow who did what to who, and the lack of depth makes it not more than an introduction to a very complex topic.